← How Fast This Garden Grows! A researcher out of Cornell University has released a study about the genes that control tomato ripening and flavor. There have been lots of studies done about what flavor chemicals or other factors affect tomato flavors. This article finds a correlation between the presence of the “uniform ripening gene” and lack of flavor. Basically, tomatoes that contain the uniform ripening gene (it was originally a mutation in the 1920s) have lost the ability to photosynthesize in their fruit, reducing the amount of sugar and nutrients they develop in the fruit. 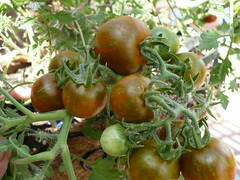 The uniform ripening gene is what makes tomatoes turn uniformly red instead of having green shoulders or less uniform red color. Posted on July 3, 2012, in Around the Garden and tagged Tomatoes. Bookmark the permalink. Leave a comment.